Official site of Dodge vehicles – Dodge vehicles are American muscle cars built to be driven. Explore Dodge.com for information on vehicles, dealerships, incentives, multimedia and offers. FCA US LLC – A North American automaker with a new name and a long history. Headquartered in Auburn Hills, Michigan, FCA US is a member of the Fiat Chrysler Automobiles N.V. (FCA) family of companies. FCA US designs, engineers, manufactures and sells vehicles under the Chrysler, Jeep, Dodge, Ram and FIAT brands as well as the SRT performance vehicle designation. The company also distributes the Alfa Romeo 4C model and Mopar products. Dodge | Facebook – Dodge is on Facebook. Visit To connect with Dodge. Dodge on Twitter – Official Dodge Twitter channel. Dodge – YouTube – The Official Dodge Brand YouTube Channel. Dodge Merchandise – Official Dodge Branded Merchandise. SRT Track Experience – The SRT Track Experience is an entire day of full-throttle action for SRT vehicle owners and performance enthusiasts alike. Born Dodge – Born Dodge features the latest Dodge social news through Facebook, Twitter and YouTube. 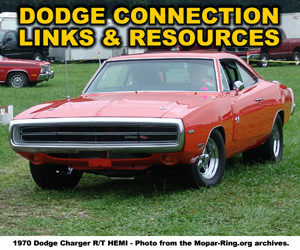 Explore Dodge events, view photo galleries and connect today. Redline Dodge – The Official Blog of Dodge. Mopar Parts – Mopar distributes approximately 280,000 parts and accessories in more than 90 countries and is the source for all original equipment parts for Chrysler, Jeep, Dodge and Ram vehicles. Top 100 Truck Sites – A collection of truck related resources including Big Rig sites, Classic Truck sites, Club sites, Truck Enthusiast sites, Modern Truck sites, off road and 4×4 sites, Parts and services sites and more.